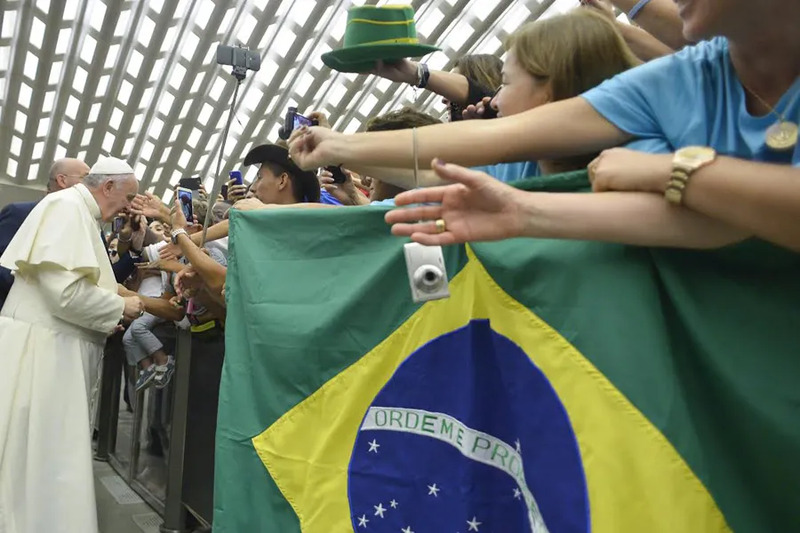 Vatican City, Apr 20, 2017 / 08:00 pm (CNA/EWTN News).- Pope Francis sent a letter to the president of Brazil, apologizing for his inability to visit in 2017 and encouraging the leader’s attention to the country’s social issues. “Since in his letter President Temer made reference to his efforts to confront the social problems of the country, the Pope underlined that aspect and encouraged him to work for the promotion of the country’s poorest people,” the Vatican press office said April 4, confirming a letter the Pope sent a few days before. President Michael Temer invited Pope Francis to visit Brazil for the 300th anniversary of a Marian apparition known as Our Lady of Aparecida. The story behind the apparition involves a clay statue of Mary Immaculate that was caught by three fishermen in October 1717 in preparation for a feast dedicated to royalty passing through the town. The feast required a vast amount of fish, but it was not the season for it and weather conditions proved to be a challenge. After a night of fishing, the men caught nothing. Having prayed to our Lady of Immaculate Conception, the fishermen first brought up the body of the statue and then the head. After the statue was brought up, the men decided to pray with faith to “Nossa Senhora da Conceição Aparecida” – which means Our Lady of the Appeared Conception. Their nets suddenly became very full, and the catch has been considered a miracle. During an inauguration of a statue of Aparecida at the Vatican Gardens in 2016, Pope Francis said he did not know when he would be able to visit Aparecida in Brazil again “but at least I will have her very close, here.” The new statue was designed by a Brazilian artist and depicted Our Lady of Aparecida next to the three men with full nets of fish. He encouraged President Temer’s for the efforts made to resolve the county’s social issues, reiterating Aparecida’s closeness to the poor. President Michael Temer was brought into office last August when his predecessor, Dilma Rousseff, was impeached from office for an alleged abuse of power. Brazil’s economy has been in its worst recession since the 1980s; inflation increased by 10.7 percent and unemployment increased to 9 percent in 2015. Prices for Brazilian oil, iron ore, and soya also dropped. Since his induction into office, Temer has aimed to reduce the country’s spending and the level of public debt. Vatican City, Feb 23, 2018 / 11:40 am (CNA/EWTN News).- On Friday Pope Francis returned from his week-long Lenten spiritual exercises in Ariccia, where he and members of the Roman Curia have been on their annual retreat since Sunday afternoon. 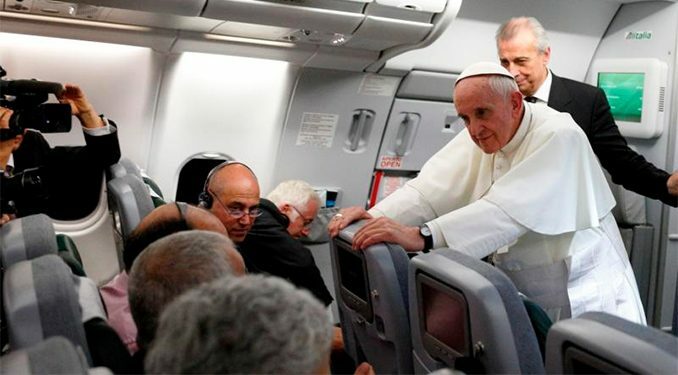 Before boarding the bus that would take him back to Vatican City, Francis thanked the priest who preached the exercises for his reflections and for encouraging members of the Curia to be open to the Holy Spirit and not stuck in bureaucratic structures. “Thank you, Father, for having spoken of the Church, for having made us, this small flock, feel the Church,” the Pope said Feb. 23. De Mendonça is vice-rector of the Portuguese Catholic University in Lisbon and has been a consultant of the Pontifical Council for Culture since 2011. He was ordained a priest in 1990 and completed his master’s degree in Biblical Studies in Rome before later obtaining a doctorate in biblical theology from the Portuguese Catholic University, where he later taught as an assistant professor. Francis noted that there are many people today like the centurions and the guards at Peter’s prison who live with an “an inner search” and who know how to tell when there is “something that calls” them. 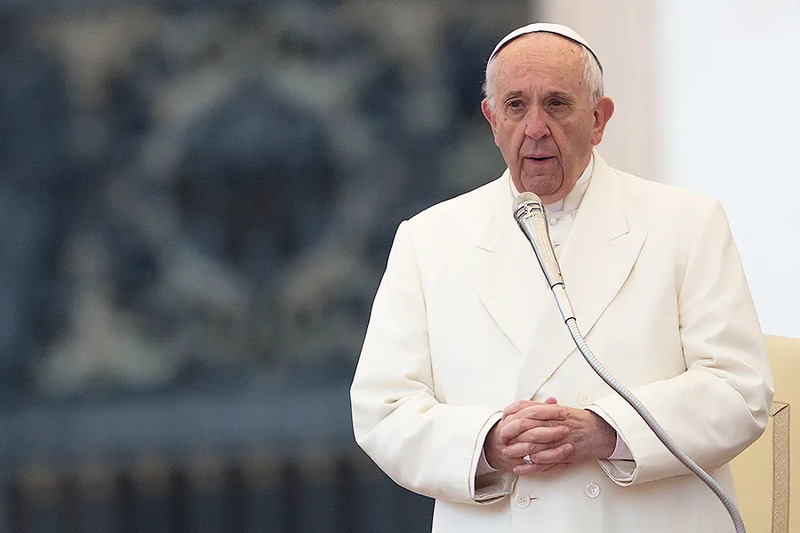 The Pope also noted how he had declared Friday as a day of prayer and fasting for South Sudan, the Democratic Republic of the Congo, and Syria, saying the spiritual retreat is extended through the offerings they will make on behalf of the war-torn countries. Held Feb. 18-23, this year’s curial Lenten spiritual exercises began Sunday evening with adoration and vespers. The rest of the week followed a basic schedule beginning with Mass at 7:30 a.m., followed by the first meditation of the day. In the afternoon, a second meditation was preached before concluding with adoration and vespers. Friday, the final day of the exercises, consisted of only a morning meditation. Pope Francis and the curia then left the retreat house, returning to the Vatican at 11:15 a.m. The exercises took place at the Casa Divin Maestro in Ariccia, a town just 16 miles outside of Rome. Located on Lake Albano, the retreat house is just a short way from the papal summer residence in Castel Gandolfo. It will be the fifth consecutive year the Pope and members of the Curia have held their Lenten retreat at the house in Ariccia. While the practice of the Bishop of Rome going on retreat with the heads of Vatican dicasteries each Lent began some 80 years ago, it had been customary for them to follow the spiritual exercises on Vatican ground. Beginning in Lent 2014, Pope Francis chose to hold the retreat outside of Rome.